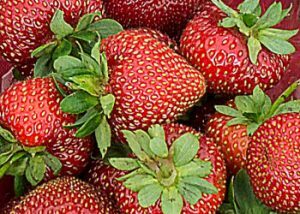 You can actually do this recipe before June when the somewhat tasteless strawberries come in as it seems to add depth and flavour to them. I have tried cutting down the sugar content and this works well, I used less sugar to sprinkle over the strawberries (about half the recipe) and less in the crumble topping (again about half) and it worked well and nobody complained that it wasn’t sweet enough. It does, however, probably depend on the initial sweetness of your strawberries. You could add some oats to the topping if you particularly like those in a crumble, and if the strawberries are big do cut them in half or even quarters. Preheat the oven to 200C/180°C Fan/gas mark 6/400ºF. Put the hulled strawberries into your pie dish, I use a round ovenproof pie dish approx. 21cm diameter x 4cm deep (approx. 1.25 litre capacity) / 8 inches diameter x 2 inches deep (approx. 1¼ quarts capacity), and sprinkle over them the sugar, almonds and vanilla extract. Give the dish a good shake or two to mix the ingredients. Now for the crumble topping: put the flour and baking powder in a mixing bowl and rub in the cold, diced butter between thumb and fingers (or in a freestanding mixer). When you’ve finished, it should resemble rough, pale oatmeal. Stir in the flaked almonds and sugar with a fork. Tip this over the strawberry mixture, covering the strawberries in an even layer and giving a bit of a press in at the edges of the dish. Set the dish on a baking sheet and bake in the oven for 30 minutes, by which time the crumble topping will have darkened to a pale gold and some pink-red juices will be seeping and bubbling out at the edges.